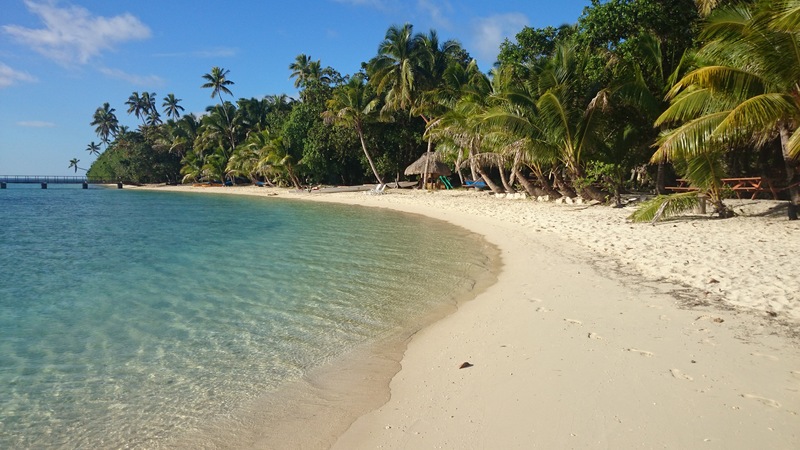 White sand, turquoise water, fresh coconut, wide smiles and the friendly call of “Bula!” following you wherever you go. Fiji really is a stunning place, but it’s no secret that budget travellers sometimes struggle with this Pacific jewel. It’s easy to get discouraged as a budgeter when you read about incredible resorts like Laucala Island, where the cheapest rooms come in at over $5500 a night, or the soon-to-open Poseidon Resort, the world’s first completely underwater hotel (and it doesn’t take a genius to realise it’s bound to be both amazing and pricey!). Not only that, but backpackers and independent travellers often find themselves put off by Fiji’s resort-focused tourism sector. In many countries, low-end resorts are synonymous with screaming kids running round a concrete pool while their parents snooze on sticky plastic deck chairs nearby. Sound appealing? Haha no – I didn’t think so. Luckily, Fiji is so much more than that, and there are some absolute gems for budget-conscious explorers dotted around the country, perfect for independent travellers and small groups after an authentic experience. Trust me here – don’t be put off by the phrase “resort”. Fiji’s backpacker-friendly resorts are some of the most beautiful, natural and laid-back places on earth. So I wanted to offer a few tips, tricks and ideas to help independent travellers stretch their Fiji Dollars as far as possible and get the most out of this gorgeous country. Fiji is made up of 333 islands – that’s a lot of ground to cover! So it should come as no surprise that the area that’s closest to the international airport – Nadi and the Mamanuca Islands – is by and large the most expensive part of Fiji. Budget travellers who are serious about getting bang for their buck need to do some exploring further afield, and there are a few ways to do that. Consider exploring Fiji’s Northern Division, including Vanua Levu and Tavauni, the garden island, along with a hundred others. Few tourists come this way, but those who do experience a unique side of Fiji away from the bustle of the beaten track. There are jungles, waterfalls and coral reefs to explore, all at prices that are a lot easier on the wallet. You’ll need to take a local flight or long-distance ferry to get there, which is an experience in and of itself! If you want to get so far away that the beaten track becomes just a memory, you could explore the Eastern Division and Kadavu. Transport is infrequent so if you opt for this, make sure you have time to spare (weeks rather than days), and come prepared for a full cultural immersion experience. The most budget-friendly option, take a south-bound bus out of Nadi along the Queen’s Road and head down to the Coral Coast. You could continue all the way east to Suva, and from there head north along the King’s Road, up to Rakiraki and eventually all the way around the island back to Nadi. You’ll see stunning scenery, get a great cultural experience in the form of the bouncy, crowded bus ride (which can actually be really fun!) and have the opportunity to experience some of Fiji’s best budget spots. And the whole thing will set you back less than FJ $30 (about AU $20). Jump on a big yellow catamaran and head north-west to the Yasawa Islands, the Mamanuca’s more remote, more relaxed, more budget-friendly cousins. While there are certainly cheaper options on the mainland, you can’t beat the Yasawas for classic white-sand beauty – it’s like living in a postcard. Exploring local food is a highlight of any journey, and Fiji is certainly no exception. But the best news for budget travellers? Local specialities are cheap and plentiful, and it’s easy to spend just a few dollars on satisfying, delicious local meals. An absolute favourite of mine, roti parcels are a Fijian version of an Indian classic, and eaten by indigenous and Indo-Fijians alike. Soft flatbread is wrapped around a dollop of thick curry and parcelled up to grab and go. It’s always a bit of a mystery what you’ll get – potato, eggplant, chicken, mild, spicy – but that’s part of the fun. Sold by market and street vendors, a roti parcel will set you back a hefty FJ $1 (about AU $0.60). Yum! Gorgeous tropical fresh fruit is everywhere in Fiji, and you’ll see vendors of pawpaw, pineapple and watermelon along every roadside. Or, head to a market for a real cultural experience – the Suva Municipal Market is the biggest in the Pacific. Fruit and veg are usually sold by the “heap” or small pile, which will set you back FJ $1-$4 depending on the season. Just make sure you wash or peal your fruit before you eat it. You won’t find pineapple sweeter than this. Most of Fiji’s town centres are full of little Indian cafes serving a variety of curries and deep-fried delicacies. For the most budget-friendly option, go for vegetarian – a full meal consisting of veggie curry, roti, dahl, a little salad and chutney will set you back as little as FJ $3 (AU $2). Lash out and spend an extra dollar to try the seena – truly Indian-Fijian fusion, they’re native roro leaves basted with a thin bean flour batter, rolled, sliced and fried, and delicious with tamarind sauce! Follow your nose to the local market, and in the back you’ll find dozens of people selling local lunches for a few dollars. From whole baked fish with rice and salad, to sausages and eggs, to fresh octopus stewed with coconut milk, lime and chilli – there are loads of options to make you feel just like a local. Who can go past a fresh coconut? In the towns, boys will collect fallen coconuts and set up shop with a machete by the side of the road – a freshly opened green coconut will cost you about FJ $1 (AU $0.60). Or, if you’re at a resort, on an island, or handing out with locals, just ask. Most men will be happy to demonstrate how to climb a coconut palm and laugh with you over a fresh coconut for nothing more than a smile and a conversation. You can’t beat that! Beachfront bures serve as dorms at Barefoot. A few guys decided they wanted to sleep on the beach without forgoing the comfort of their beds! Oh, Leleuvia. A speck of sand crowned by a dense palm tree jungle and surrounded by coral reefs – this is what you imagine Fiji to be. And seriously – it’s kinda budget friendly! Ok, so it’s at the upper end of the spectrum, but there’s a nice dorm and the spacious bure (huts) sleep five and are right on the edge of the water, so if you team up with a few friends, it’s easy. Leleuvia is off the eastern coast of Viti Levu, the opposite side to Nadi and the popular Mamanucas. Consequently, it sees fewer visitors and prices are lower – resorts this nice charge five times the price elsewhere in the country. Hard to say, worth the visit. Off the coast of Rakiraki in north-east Viti Levu and home to some of Fiji’s best coral reefs, the island also hosts a selection of budget stays. Safari Lodge will even let you self-cater, so stock up at the MH supermarket in Rakiraki and cook yourself a feast (don’t buy fridge things though, as electricity can be intermittent). On the coast of Taveuni, gorgeous little Lavena isn’t far from ultra-lux Laucala Island, but for less than a tiny fraction of the price. A local-run place, Lavena Lodge is owned and operated by Lavena Village and the money earned goes straight to village infrastructure projects and maintaining the renowned Lavena Coastal Walk. Bright and airy and right on the beach, this place will set you back less than FJ $20 (AU $12) a night. A short hike, then it’s time to take the plunge! This was the view from my dorm at Barefoot. Take me back? Please? Pull up a bit of sand, jump in the water, or take a seat around a kava bowl. Fiji is all about relaxing. No one here takes life to seriously, and you’ll soon adjust to “Fiji time” where things slow down and everyone just goes with the flow. Fiji’s waters are warm and clear, and the extensive reefs make them very calm close to shore and easy to paddle about it. Lash out and rent a snorkel to explore underwater in more detail – the variety of fish and other sea life is absolutely stunning. Many places will charge about FJ $15 (AU $10) to rent a snorkel, mask and fins for your whole stay, whether that’s a day or a week, so it can be quite good value. Maybe this isn’t everyone’s idea of relaxing, but there’s something about exploring the jungle and being out in the wild that I think relaxes the soul. Stick to the path, as it’s very impolite to wander onto village land without a local guide. Even better, find a guide – many Fijians are highly knowledgeable about bushcraft and natural medicine, and can tell amazing stories. And you’ll often find a waterfall at the end of the trail to cool off in! No I don’t mean alcohol! (Though there are some great cocktail makers in Fiji…) I’m talking about kava, Fiji’s national drink. Known locally as yaqona or jokingly as grog, kava is made of a specially prepared pounded root, mixed with water and drunk ceremonially from a carved wooden bowl. Wherever you find a group of Fijian men, you can be sure a kava bowl isn’t too far away. Join a circle in the evening, have a few bowls and join the conversation. I hope I’ve got you convinced that Fiji isn’t just for people with money to burn. If you go local, get out of the main tourist hub and explore, Fiji is an amazing place for budget independent travellers. Virgin Australia fly direct to Nadi several times a week. This post is my entry into Virgin’s ProBlogger Events competition, so if you’re thinking of exploring paradise, check them out. If you want any advice on figuring out where to go, more details about how much things cost, help planning how to get there, or anything else, drop me a line – I’m more than happy to help! Have you been to Fiji? What’s your best budget travel tip?